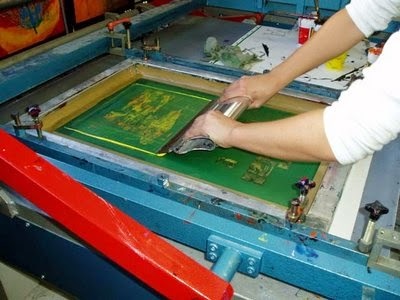 Screen printing is a printing technique that uses a woven mesh to support an ink-blocking stencil to receive a desired image. Screen printing is an old age process and involves creating a screen and uses it as a stencil to apply layers of ink on the printing surface. Different screen is needed for each colour that is used in the design, one at a time, combined to achieve the final look. For this, various types of printing screen are need. Here printing screen preparation flow chart is given below. Applied chemical autosol and potassium dichromate on the mesh & dried 8 min in air. Placed design paper under the mesh. Light passes through the design paper & mesh fabric for 3-4 min. Remove the colored TXR from the design area by water spraying.